Although I enjoy washing my hair for the most part, I’m not one to devote a whole day to the process. I cut corners, I skip steps, I do what I have to do to get it done. I think that’s why Henna never really appealed to me. I’d rather do something else with my time. One step I’ve skipped for a while was pre-pooing. I go back and forth on whether or not it’s necessary, but lately I’ve been feeling like it’s necessary. I use a pretty harsh shampoo because of my scalp (Selsun Blue), so having oil in my hair during my wash session lessens the blow to my strands. Lately, I’ve been pre-pooing and washing my hair at the same time! How, you ask? Let me explain. 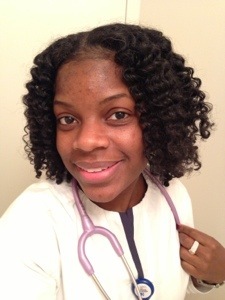 I section my hair into four sections and twist each section. I apply my oil for pre-pooing my hair (usually coconut oil, lately Vatika Oil). I use a spray bottle with water to wet just my scalp. I apply shampoo only to my scalp one section at a time. I leave my hair in four sections (twisted) and let it marinate for at least a half an hour. (The dermatologist recommended that I leave the Selsun Blue on my scalp for 20 minutes). I rinse everything out and proceed from there. I like this method because there’s less detangling, less time I spend under the running water and my hair feels moisturized and not stripped when I’m done. I kill two birds with one stone! P.S. I separated my twists more today. How’s that? Hi Rece, your hair is lovely! I do skip steps as well, glad to find a kindred spirit;() I have a suggestion for you regarding the dandruff, how about adding 3 drops of tea tree essential oil to your oils and rubbing it on your scalp before conditioning or even pre-poo. Leave it on for about 20 minutes before you rinse your hair. I know dermatologists should know best but having spent YEARS fighting dandruff I came upon this solution (much to the surprize of a certain high-powered celebrity black dermatologist) which has saved me dollars, itchy painful and bleeding scalp and embarrassment. My dandruff was the thick clumps that ate away at my hairline and was in my eyebrows and around my nose!! Gross and not a good look for too many years. Three years later no dandruff, I’ve stopped using the tea tree oil treatment but I do spritz my scalp with Green Tea tea or 3 drops of tea tree oil in distilled water both acts as an antifungal, which is what dandruff is…a form of fungi:(. Give it a shot, your beautiful hair will thank you..no more dry, straw strands for you! and your scalp will be clean and healthier than it has been since you got dandruff. Be patient, put some of the oil mixture on your scalp every two/three days in the beginning until you no longer have obvious flakes and itching. DITCH that SELSUN it sure isn’t good for your hair… I mean our hair is dry without having dandruff why use a chemical to strip it further! Thank you sooooo much for all of the info in your comment. Recently I was mixing a few drops of tea tree oil with vitamin e oil to apply to my hairline. I thought of this because the prescription medication is an anti fungal and I didn’t like it. Knowing that tea tree oil is an anti fungal as well, I thought it would be a great idea. My hairline cleared up very nicely but I never thought to apply it to my whole scalp. I’ll definitely try that this weekend. I hope to be able to use whatever shampoo I want, one day!